Ever since Uber became an international success, every transportation service has wanted to follow in its footsteps and even surpass it in terms of popularity. The so-called “Uberization” of the logistics industry is occurring rapidly. We’ve already talked about logistics mobile app development, focusing on freight transportation. This article will address inquiries we’ve had from customers who are considering creating an Uber for delivery trucks. According to the American Trucking Association, trucks move about 71 percent of all freight in the US. Revenue from freight trucking in the US surpasses $700 billion annually. But local trucking industries are often inefficient and unprofitable. One reason for this is that truckers often drive back empty, making so-called deadhead trips, which are almost as costly as moving a full load. According to a report by the American Transportation Research Institute (ATRI), nearly 20 percent of all miles are driven empty. Moreover, deadhead trips can be dangerous for drivers. The entire truck arrangement (including the braking system) is designed for large loads. So driving an empty truck is more difficult and requires more precautions, especially when there’s rain or strong wind. In order to achieve full truckloads (FTL), improve the utilization of trucks, and enable safe driving, carriers usually work with freight brokers, who connect them with shipping companies. A freight broker serves as a liaison between carriers and shipping companies, performing a very important role in the movement of cargo. However, there are a number of downsides to working with a freight broker. For example, shipping companies still need to pay brokers up to 20 percent commission. Moreover, it’s not always possible to effectively and quickly match a shipper with a carrier considering that most brokerage processes still heavily rely on email, fax, or phone to coordinate shipments. The whole process may take two or three hours, considering that a broker should win the load, put it in the load board, then find drivers, and negotiate shipping rates (left alone billing and collecting). This system doesn't seem very efficient. How can shipping companies and carriers effectively cooperate and solve their business challenges without involving a freight broker? 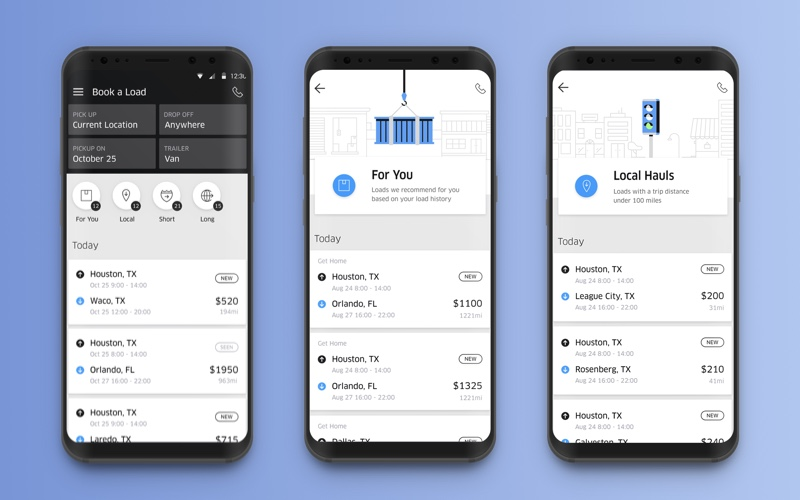 Much like Uber connected taxi drivers with passengers, your shipping app can connect shippers and truckers, eliminating the need for an intermediary. A service that establishes direct connections between truckers and those who need them might be dubbed an Uber for trucking. The logistics industry would surely benefit from a new mobile transportation app that serves its needs. An app can help industry representatives lower expenses, improve visibility across a company’s entire supply chain, and most importantly, prevent trucks from having to return empty. There are already a few companies using mobile technology to seamlessly connect shippers with carriers. One of the most popular and largest online shipping marketplaces, uShip is designed to facilitate any kind of shipment. uShip can use almost any carrier regardless of their specialization. The platform cooperates with large companies and solo truckers. 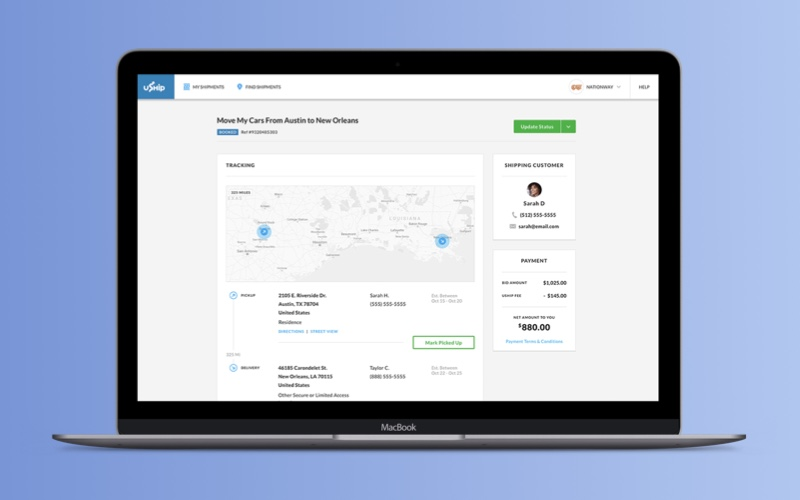 uShip is easy to use and has a lot of advanced features for carriers, shippers, trucking businesses, and even brokers: for example, price estimates, real-time tracking and notifications, and a built-in secure payment system. uShip is based in Austin, Texas, and has a branch office in Amsterdam. The company offers its service in 18 countries, including a few in the European Union. 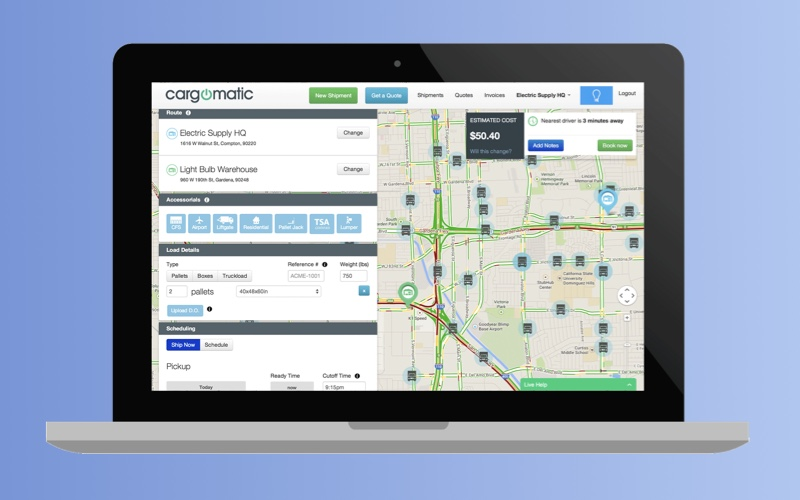 Founded in 2013, Cargomatic is an excellent example of Uber for trucking. Cargomatic is based in Long Beach, California, and targets shippers and local trucking companies, helping them to fill their trucks for legs of a trip for which they don't have a full load. In August 2018, Cargomatic raised $35 million in series B funding for rebuilding and growing after a difficult period of business development. We often get requests to make an app for logistics like Cargomatic. Cargomatic offers two apps: the Cargomatic Shipper app and the Cargomatic Driver app. In the app for shippers, users can list jobs by specifying freight dimensions and pick-up and delivery information. This information is sent to the Cargomatic virtual dashboard, which pings nearby carriers on the network. Carriers can accept jobs using the Cargomatic Driver app. As soon as a shipment is accepted, Cargomatic sends a text or email notification to the shipper notifying them that the driver is en route to pick up the freight. Shippers can track the location of their freight in real time all the way to the destination. After the shipment is delivered, the driver takes a photo of the bill of lading using the Driver App, and proof of delivery is emailed to the shipper. Cargomatic also makes sure truckers get paid shortly after a job is completed. It provides pricing transparency by determining how much a driver makes based on the weight of goods and the distance they’re moved. Pricing transparency is essential to take into account for those who want to build a cargo tracking app. Based in Seattle, Convoy, an online freight marketplace, is one of the fastest-growing startups. Founded in 2015, it reached unicorn status in 2018. The company’s main vector of development is introducing changes to the trucking industry through the latest technologies. Just a few months after getting investment from CapitalG, Convoy announced a breakthrough: automatically matching loads and trucks without any human involvement. Transfix was founded by Jonathan Salama and Drew McElroy in 2013. Based in New York, the company offers online brokerage to achieve FTL. The main idea of Transfix is to help carriers find loads and make arrangements with shippers quickly and easily. The Transfix application allows users to track shipments in real time, receive alerts about a shipment’s status, and upload proof of delivery (POD) pictures. In 2018, Forbes named Transfix one of the next billion-dollar startups of 2018. For now, the company’s total funding is $78.5 million. As far as we’re talking about Uber for trucking, we should also mention the application that Uber actually created for the trucking industry in late 2016. Just like its close competitors, Uber Freight was launched with the ambition to matching truck drivers with available capacity to available loads to reduce deadhead miles. The service is strictly moderated to ensure its reliability: access to the mobile app is possible only after registering on the official website and having a user’s profile approved. If you would like to create a tracking app for cargo shipping that establishes a direct communication channel between a carrier and a shipper, you’ll need to create a set of tools, such as a mobile app, a web app, and a server to store user data. As a web and mobile app development company, we can take care of logistics app development for iOS, Android, and web. We also handle backend development. Your role in this process is to establish partnerships with carriers and grow the network of your Uber for truckers. Data on each vehicle — such as type, size, and real-time location — is necessary for making this type of app work. Uber for shipping requires two types of users: drivers and shippers. The goal of a mobile app for drivers is to let carriers fill the empty space in their trucks all the way to their final destination. You should enable all drivers in a given area to view a list of available shipments. The carrier that accepts a shipment first gets the job. You should also make it clear for a shipper that they can’t cancel a shipment once it’s been accepted by the carrier. The other advantage of your service for drivers is the speed of shipment processes. 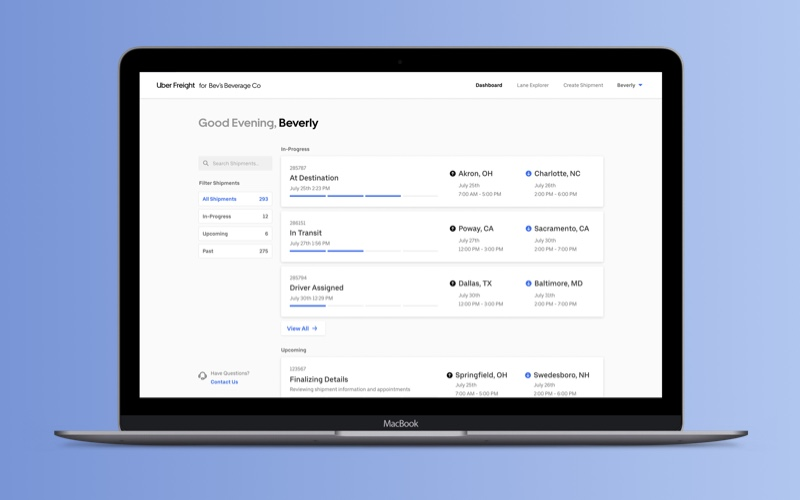 According to Drew McElroy, Transfix co-founder and CEO, traditional freight brokers need about three hours to manage a shipment and negotiate to load. It takes 30 minutes with Transfix. One more important question that needs to be addressed when it comes to developing a reliable logistics service is how you accept drivers to the platform. Well-thought-out terms are vital in the logistics business. The more reliable a carrier is, the more shippers will be willing to move their freight using your logistics application. That’s why the first and greatest requirement is to provide your customers with legitimate carriers through your platform. There can be different terms under which carriers get access to shipments through a logistics service. Like Uber and other on-demand services, Cargomatic accepts any carriers with valid Carrier Identification or Motor Carrier numbers and cargo insurance and trains its new carriers through an onboarding process. Only after onboarding is completed and all relevant certificates are provided does Cargomatic accept the carrier. You can’t even download the Cargomatic app unless you’re a shipping company or certified carrier. Pre-screening of drivers will allow you to meet the highest industry standards and earn trust in your service. A well-organized rating system will help your platform maintain trust. Additionally, your system should be location-aware not only to match users based on their location but to track shipments and help drivers effectively navigate while carrying cargo. Most carrier companies have their own GPS systems that identify the location of every vehicle they operate in real time. In this case, you would only need to get access to this data and store it on your server. If a given carrier doesn’t have such a system, you could either help them install one or explore additional options. Shippers should be able to use your transportation app to find a truck in their area. To develop a mobile app for vehicle tracking, you should aggregate carriers for a shipper to choose from and notify shippers once a shipment has been accepted by a carrier. Ideally, a service that connects shippers with carriers will also handle issues with documentation, insurance, payment processing, delivery confirmation, and anything else that might slow down the transportation process. An Uber for shipping app should not only automate processes, fill trucks, and make the world a better place. It should also offer a user-friendly pricing policy. That’s why it's a good idea to think about a pricing algorithm for your trucking logistics app. For example, uShip’s fee is 10 to 20 percent of the estimated value of the freight. Uber Freight’s pricing is based on distance (as Uber’s is). Cargomatic might look less price-friendly than other apps, as they charge 20 percent of a total transaction (like traditional brokers). But it’s honestly worth it given the opportunities the app offer: higher container utilization, the ability to avoid time-consuming administrative work, and guaranteed payment with fewer delays. The average Cargomatic order entails moving one ton of freight 20 miles and costs about $145. For a new trucking logistics app, it’s best not to set high fees. If you start with 10 percent, for example, you can increase the price as you add new features. You may also offer an advanced set of tools that are paid (for drivers, shippers, and businesses). Transparent pricing and quicker transactions will help you build trust with your clients and grow your business. Attracting a carrier company to your platform is not so difficult once you demonstrate the real value of your service. The market success of Uber and similar apps such as Lyft and Hailo has shown that people are willing to pay a premium for the ability to secure transportation via their smartphone. This is a brief overview of the features needed to create a mobile app for cargo shipping. The industry is rapidly maturing, and it’s high time to make an app for logistics. By developing a solution for transportation, you can help trucks move around more efficiently and less expensively. This way you can lower prices, shorten delivery times, and even reduce air pollution by allowing trucks to take fewer empty trips. Thinking it’s time to get started on your app? We look forward to helping you develop the ultimate Uber for trucking.